Defect-tolerant semiconductors have the ability to retain the electronic properties of their pristine form even in the presence of defects. Currently, the presence of antibonding states at the valence band edges induced by a lone pair of 6s2 or 5s2 electrons is used as a descriptor to predict defect-tolerant semiconductors. Based on this descriptor, bismuth triiodide (BiI3) has been proposed as a defect-tolerant semiconductor with promise for photovoltaic applications. However, clear demonstration of the defect tolerance of BiI3 including a comprehensive study of the type of defects and their effect on the electronic structure has not been reported so far. Here, we present an atomic-scale landscape of point defects and intergrowths in BiI3 using a combination of density-functional-theory calculations and aberration-corrected scanning transmission electron microscope imaging. 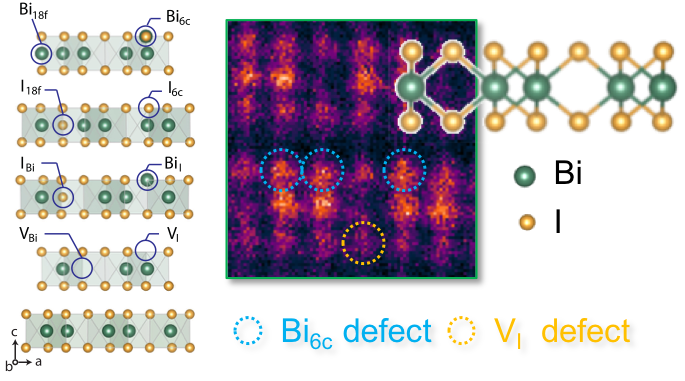 We show that BiI3 is not a defect-tolerant semiconductor as intrinsic point defects have low formation energy and show transition levels that are deep within the band gap and can act as nonradiative recombination centers. We show that Bi-rich growth conditions lead to higher carrier concentration over I-rich conditions. We also show the presence of intergrowths that are made up of a bilayer of bismuth atoms sandwiched within BiI3sheets with a missing layer of iodine atoms. These intergrowths result in metallic behavior within the semiconducting matrix of BiI3. We propose that atomic-scale control of the intergrowths can be beneficial to avoid carrier trapping and to enhance photon absorbance. Overall, this work highlights the need to go beyond heuristic descriptors based on band-edge characteristics to predict defect-tolerant semiconductors.